Shipping rates do not include duties, taxes, other customs clearance or brokerage charges for shipments outside of the United States. The buyer is fully responsible for those fees and related regulations of the buyer’s countries. Shipping to Canada: Many of our products are also available for shipment to Canada. Please contact us for shipping rate. International tax and duty: International shipments are subject to import fees, duties and taxes, which are levied once a shipment reaches their country, in addition to the brokerage fees/custom clearance charges which may be imposed by the carrier. These charges must be borne by the recipient. Savyboat.com has no control over these charges and cannot predict what they might be. Ground Service: Normally delivery within 2 to 8 business days. Standard Overnight: When you need it there next business day in the afternoon. Delivery is by 3 p.m. to most areas and by 4:30 p.m. in PST to some rural areas, throughout all 50 states (Hawaii service is outbound only). No delivery on Saturday. International Economy: Time-definite delivery typically in 2–5 business days (typically 2 or 3 business days to Canada, Mexico and Puerto Rico). From the U.S. to more than 215 countries and territories. International Priority: Time-definite delivery typically in 1, 2 or 3 business days. From the U.S. to more than 220 countries and territories, and to the U.S. from more than 220 countries and territories. How are the model ships packed? 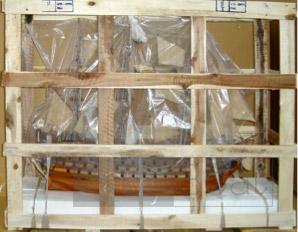 We guarantee the ship will arrive safely with our professional packing. 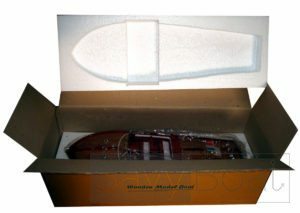 Normally 80% of our ship models will be packed inside a wood crate including Tall ships, Cargo ships, Ocean Liners, Battleships… The rest will be packed inside solid styrofoam such as speedboats, hydroplanes … Depending on distance or fragility of the model we might double-box for more secure.